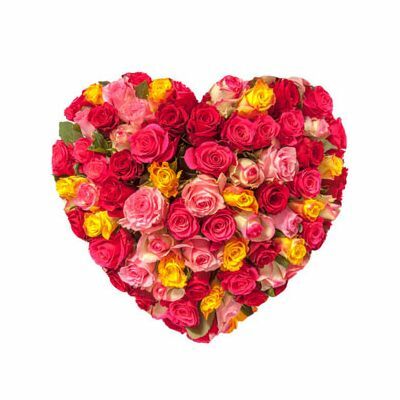 What is a better way to win someone’s heart than our Multicolor Heart floral heart arrangement? Our flowers are fresh and hand picked by our florist. The floral arrangement in the shape of a heart is elegantly done keeping in mind the color co-ordination. Greenery is added to 75 multicolor roses to make the arrangement more striking. Express your warm sentiments and send roses bouquet online. Our fresh flowers will bring smiles on your loved ones’ faces. The Multicolor Heart is suitable for any occasion Birthday,Wedding Day, Anniversary, Baby Showers, Get Well Soon,Thank You and many more. • Free Same Day Home Delivery Service Available • Free Home Delivery Service Available Consider for: Birthday, Wedding Day, Anniversary, Baby Showers, Retirement, Mother's day, Father’s Day, Gifts For Boss, Gifts For Him, Gift For Her, Valentine's day.